How to map square texture to triangle? I want to find the texture coordinates for point P. I have the vertices of the triangle and their corresponding uv coordinates. The numbers in the little squares in the texture represent color values. 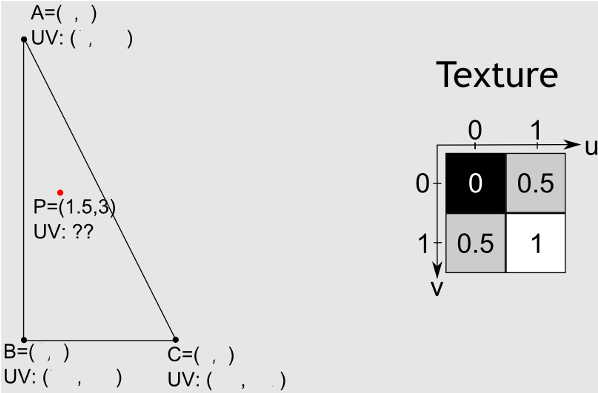 What are the steps of computing the uv coordinates of P? You need to convert the point into barycentric coordinates and then use those points to interpolate the u, v coordinates. Here is a previous answer that can help calculate the coordinates: What's the most efficient way to find barycentric coordinates? This works to linearly interpolate any property of each vertex across the triangle. Beware that interpolating normals linearly doesn't do what you want it to do as the normal becomes denormalized. This isn't an issue in your case. Not the answer you're looking for? Browse other questions tagged textures rendering uv-mapping or ask your own question. What's the most efficient way to find barycentric coordinates? How does Texture Mapping work? How to implement Index Buffer Object (IBOs) with texture coordinates in OpenGL? How to deal with texture coordinates without range?